Using Google’s Webmaster Tools is a great way to find little issues that might be holding your site back from ranking better in the Google SERPs. It had been a few years since I hopped into Webmaster Tools, and when I did, I noticed a number of errors in the Structured Data section. Clicking a few links it seemed that Google wanted to see “Updated” and “Author” data called out on many of my pages and posts. After poking around a big on the WordPress forums, I found that most people answering questions didn’t really understand what was being asked, nor what Google was looking for. I have played around with Rich Snippets and other Microdata information, so I had a good idea of how to solve the problem…it was just going to take a little poking around in the WordPress Codex (their repository of the code snippets that give users access to all of the information we have entered into our blogs). This information is for people with “self-hosted” WordPress blogs. In other words, your website is not hosted on wordpress.com. Also, use this information at your own risk. Don’t freak out if you don’t know what your doing and your website goes blank when you start changing code in your wordpress files. Computers need things to be perfect, not close. So, take your time and make sure you don’t leave out punctuation, or add extra spaces here and there…sometimes, a semicolon can be the difference. Use of any information you find here is at your own risk. You have been warned. For the un-initiated, delving in to the workings of a WordPress blog can be a bit daunting. But, it need not be so. Updated on: <span class=”date updated”><?php echo get_the_modified_date();?></span> by <span class=”vcard author”><span class=”fn”><?php the_author_link(); ?></span></span>. Use the WordPress Codex for more information on get_the_modified_date() and the_author_link() functions and options for changing how they work. 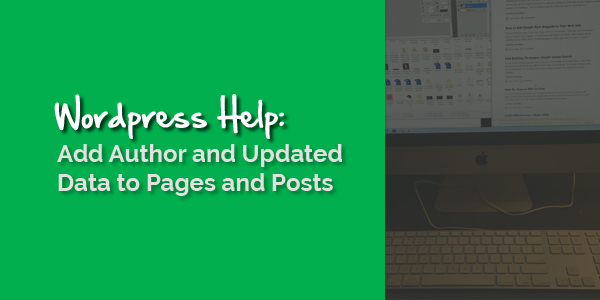 Adding updated and or author data to your pages is just as easy. Instead of using single.php, your theme likely uses the page.php file as a template for your pages. You should see this data listed at the bottom of this post to get an idea of what you can expect. Ok, so as with anything, there is no perfect solution. Modifying your theme’s files is a dicey proposition. This is because when you update your theme, it may overwrite the changes we just made. To deal with this, I keep a note in Evernote of the modifications I make to the theme I use. When I need to update the theme, I know that I have to make a few changes on top of the them update. This happens very infrequently, so I am ok with this system. If you have any questions, please leave a comment below and I will try my best to respond.